Bears: what draws them to populated areas, and how can we coexist with them? An expert shares advice and information about our intelligent, thumbless neighbors; full coverage in this week’s issue. 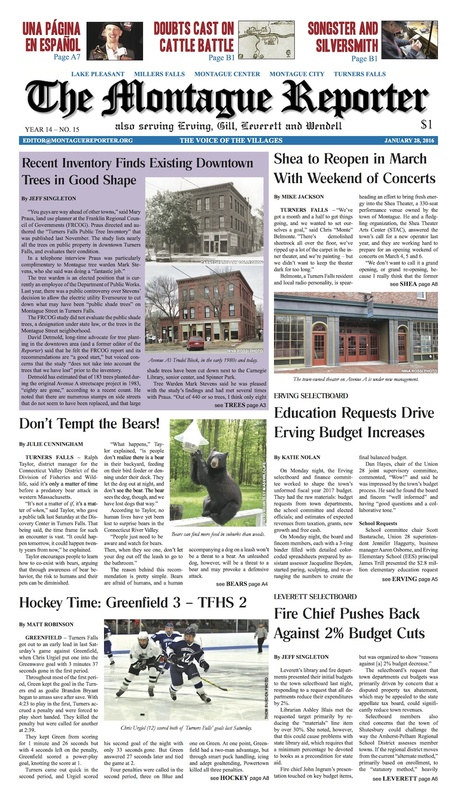 Plus: the state of Turners’ trees; the Shea plans a weekend packed with music for its March reopening; selectboard coverage from Erving, Gill, Leverett, and Montague; the Gill-Montague School Committee approves a preliminary budget; our editorial looks at the dangers of an infrastructure of lead water pipes, with ramifications well beyond Flint; and our Spanish language page, Aquí se habla español, returns. But wait, there’s MoRe! 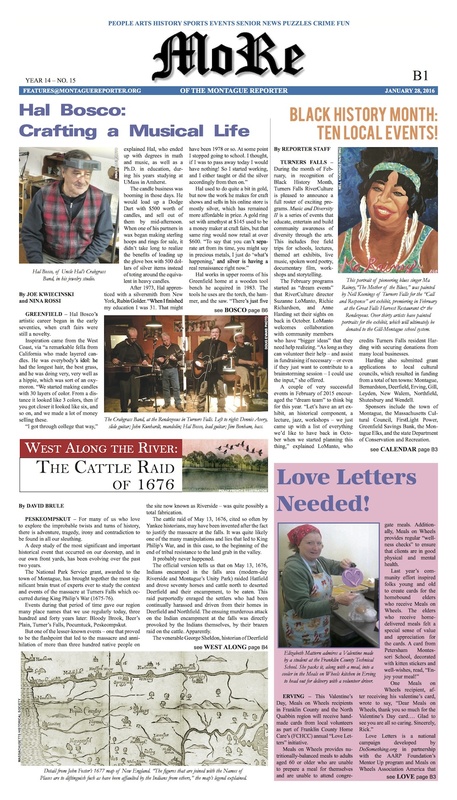 Black History Month is almost here; read about the great lineup of programs and events that Turners Falls RiverCulture has planned. Uncle Hal makes more than music — get to know this multitalented local artist. West Along The River takes us back to the Cattle Raid of 1676. Learn how you can send love to Meals on Wheels clients this Valentine’s Day. Find out how TFHS hockey and basketball teams fared this week. Do you long for a pelvic floor of steel? The Healthy Geezer is here to help. The Pet of the Week is not a bear, nor is it the squirrel who turned up in an unsuspecting resident’s dish drainer (details in the Montague Police Log). See which critter needs a home this week, and catch up on local briefs, arts and events listings, and more — on newsstands now!